So, yes, I’m in the process of slowly acquiring the remainder of Frank K. Edmondson’s library, or at least the parts of that library that are relevant to my work in the history of astronomy and instruments. Many of the books are dated, of course, but still serve as good reminders of the extensive intellectual network required to support a global discipline like astronomy. Really, all you need is the name of a single individual working as an institutional astronomer or academic—an observatory, a university—and you have an entry point into the entire history of astronomy, not just in the United States, but in the world. Reading between the (few) lines, it would appear that Drs. Eremeeva and Edmondson met in Washington, D.C., sometime after the breakup of the Soviet Union. As a token of collegiality and possibly friendship, Dr. Eremeeva offered a copy of what must have been her first book, probably based on her doctoral work. It took a little more work than this kind of thing usually does, but I finally tracked down a few other examples of Dr. Eremeeva’s historical research. Most of it seems akin to what I’m doing here, although much more professional and thoroughly researched: writing the history of astronomy through a series of biographical essays. Her publications cover a long list of astronomers and their discoveries, many not well known to the average American (thanks, Cold War). It seems that many of her subjects had ties to Pulkovo Astronomical Observatory outside Saint Petersburg. I’ve appended to the end of this post a few examples of her essays. One of them is English, so there’s something for everyone, particularly if everyone is in the mood to read about political purges of scientific communities. I should stress, this is only a partial list. If you run “Eremeeva, A. I.” or “Eremeeva, Alina Iosifovna” through the search query at the SAO/NASA Astrophysics Database, you’ll get at least 61 hits related to her work. I haven’t been able to figure out Dr. Eremeeva’s precise connection to Pulkovo Astronomical Observatory. It’s her research interest, certainly, but her institutional affiliations all seem to be associated with Moscow, so I’m not sure how she connects up with the history of the St. Petersburg institution. 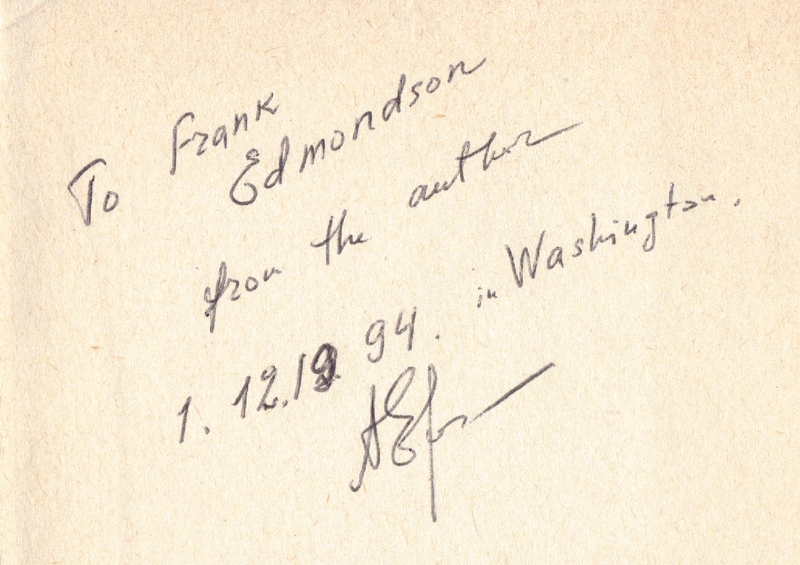 I mention this because tucked inside the book she gave Prof. Edmondson was a souvenir card from Pulkovo. Cover: "150 Years of the Main Astronomical Observatory of the Soviet Academy of Science in Pulkovo"
Clearly, I have more research to do. Look for another post on the topic one day soon. [Russian] “The Life and Work of Boris Petrovich Gerasimovich, on his 100th Birthday.” In Historical and Astronomical Research (Историко-астрономические исследования), Vol. 21 (1989): 253-301. 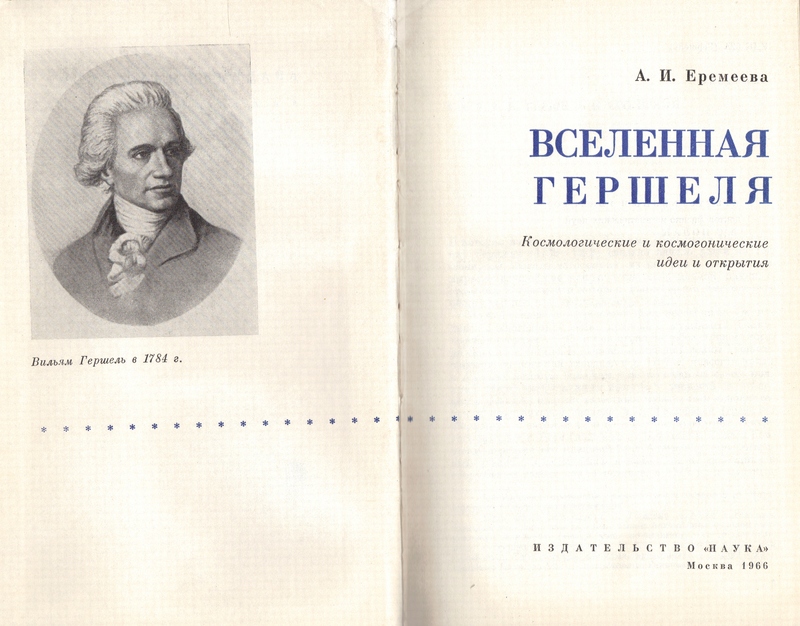 [English] “Political Repression and Personality: The History of Political Repression Against Soviet Astronomers.” Journal for the History of Astronomy. Vol. 26 (1995): 297-324. [Russian] Astronomy at the Turn of the Twentieth Century. Pulkovo-Dubna: Phoenix Publishing Center, 1997. [Russian] “Meteors, ‘Thunder Stones’ and the Paris Academy of Sciences before ‘The Court of History.’” Nature, No. 8 (2000). [Russian] “Pioneer of National Physics, on the 150th birthday of academician A. 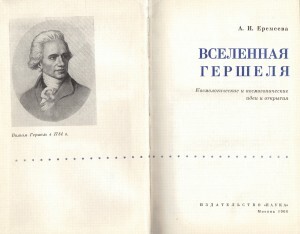 A. Belopol’sky.” Bulletin of the Russian Academy of Sciences. Vol. 74, No. 6 (2004): 534-543. [Russian] “175 years of the State Astronomical Institute of P. K. Shternberg, Moscow.” Nature, N0. 10 (2006). [Russian] “The Troubled Genius of Ernst Chladni.” Nature, N0. 12 (2006). [Russian] Giovanni Schiaparelli (1835-1910), On the his 175th Birthday and 100th Anniversary of his Death. Astronet (online) (2010). This assumption might not be true, since she published a second book that same year, Outstanding Astronomers of the World [Выдающиеся астрономы мира], also with Science Press. These are the earliest volumes I could find, so possibly both grew from her doctoral work. Did you know that at one time, Pulkovo had the largest refracting telescope (30″) in the world? It was built by Alvan Clark & Sons, who also built the telescope at Lick Observatory that displaced Pulkovo as “world’s largest” in the 1880s.